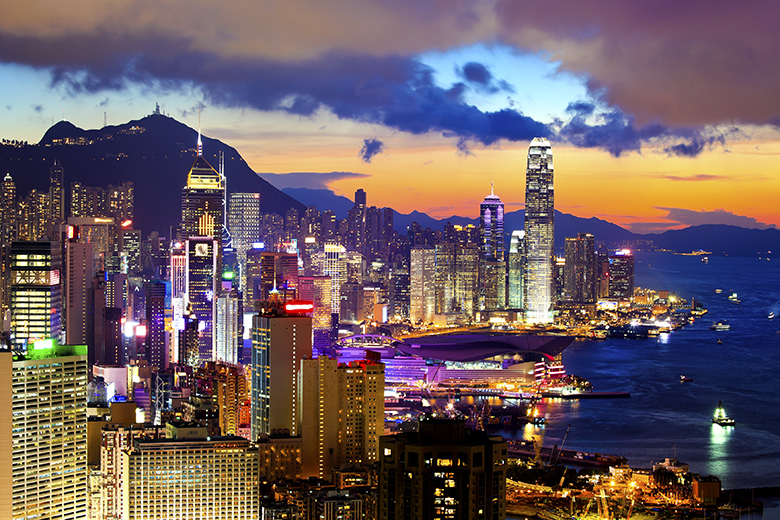 You’ve planned your Hong Kong trip, and you know it’s a small city but there’s so much to do! How will you cover all the attractions during a short stay? Should you stay there for 2 weeks? I’ll show you how to get around and appreciate Hong Kong in a easy 5 day itinerary. The city is divided into two halves – Kowloon in the North (the busy, pulsing, local district that offers an insight into traditional Chinese culture), and Hong Kong Island in the south: A chic and glamorous setting for shopping, dining, and enjoying some R&R. Our five day Hong Kong itinerary aims to provide you with a blend of the very best of the two, in addition to the highlights from surrounding areas, so that you can enjoy a trip to Hong Kong that you will remember for a lifetime. We recommend that you stay on Hong Kong Island during your trip. Here, you can enjoy comfortable hotels with modern amenities at affordable prices, and the location is a little less hectic than in neighbouring Kowloon. You have a plethora of great shops and restaurants featuring world cuisines right on your doorstep on Hong Kong Island, and the city has a fantastic public transportation network that connects both halves of the city by metro so it is pretty fast and easy to travel to any point in the area. 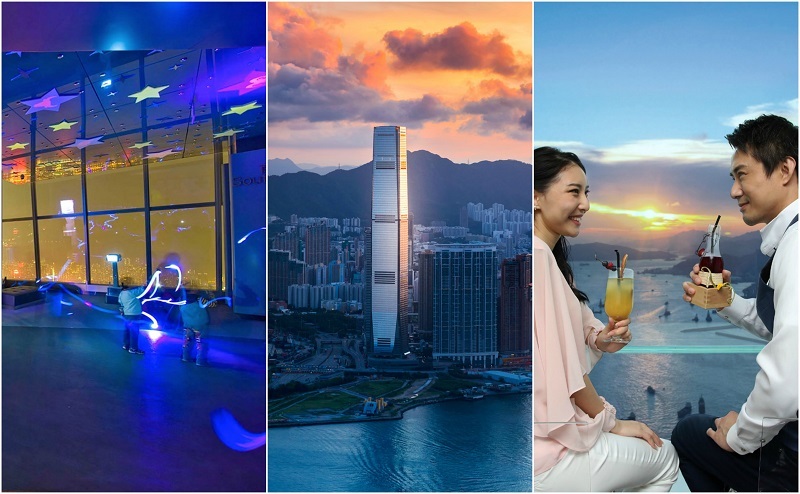 Hong Kong and Macau Attractions Pass – Save money on entering Hong Kong’s top attractions (including Disneyland, The Peak, Sky100 observation deck, and more) with this all inclusive pass. Hong Kong Travel Pass – Save money, and make traveling around the city easier with this Hong Kong transportation pass. The pass includes your airport transfer, and use of subways and public transportation within Hong Kong. You just got off the plane yesterday and this is your first full day in Hong Kong. You’re tired, you’re jet lagged – it’s ok, we get it, so we’ll take it easy on you during this first day. Man Mo is a beautiful Taoist temple located on Hong Kong Island, and one of the oldest in the city, dedicated to “Man”, the gods of literature. Make your way through the cloudy haze of scented incense as you gaze upon the elaborate carvings inside, and the worshippers burning incense coils as offerings. Hopefully your taster of ancient Chinese temples has whet your cultural appetite and left you wanting for more as we have one more on the itinerary later today. From here, it’s just a short walk to Central Piers where we will be taking the infamous Hong Kong “Star Ferry” across to Kowloon. The views of Hong Kong Island from the Kowloon side are truly stunning, especially from the water, making for a great photo opportunity. You don’t need to reserve a ticket in advance, you can just rock up to the station and purchase it there. Transportation from one side to the other starts from $2.50 HKD per person and the ride takes just 10 minutes. Though you are not immediately greeted with it, you will soon see the drastic contrast between the two sides to Hong Kong. From arrival at the Ocean Terminal, let’s spend a little while taking a walk along the riverside and admiring the views of the Hong Kong Island skyline. Located within this walking route is the Hong Kong “avenue of the stars” aka the Chinese version of LA’s Hollywood Walk Of Fame. Let’s see if you can recognise any of these names! You can also queue up here to have your photo taken with the angry looking statue of Bruce Lee. The district that we’re now in is Tsim Sha Tsui – a bustling neighbourhood filled with restaurants and bars. 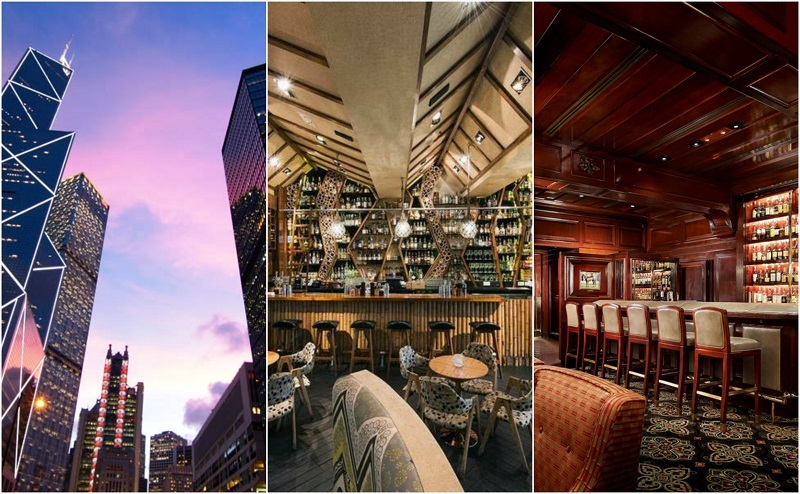 The area is often overlooked in favour of glamorous options available on Hong Kong Island but there are some great options for dining here that are much loved by locals. We recommend Cuisine Cuisine – A restaurant offering up traditional Chinese recipes with a contemporary twist. 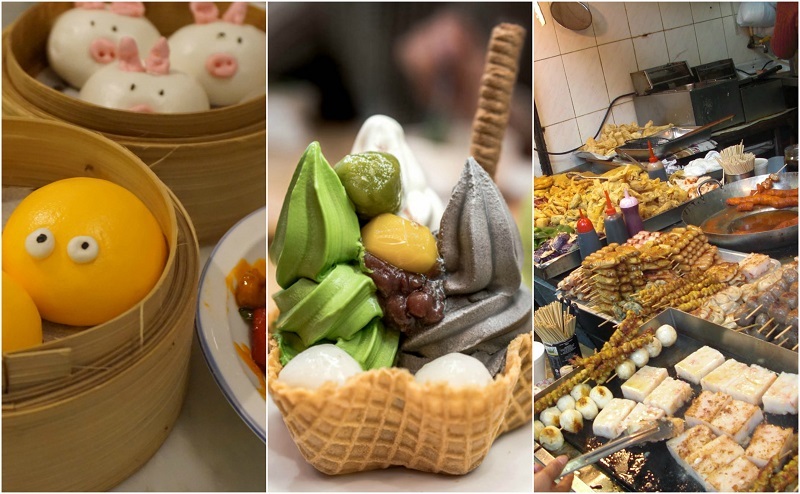 There are plenty of great and well respected eateries here offering cuisines that range from South East Asian, to American casual, and to French fine dining but when in HK, why not experiment with local tastes? Now you’re feeling well and truly stuffed like a Christmas turkey, hop on the metro at Tsim Sha Tsui station for a ride to Yau Ma Tei station (2 stops North). From here, it’s a short walk to our last temple of the day – Tin Hau temple. 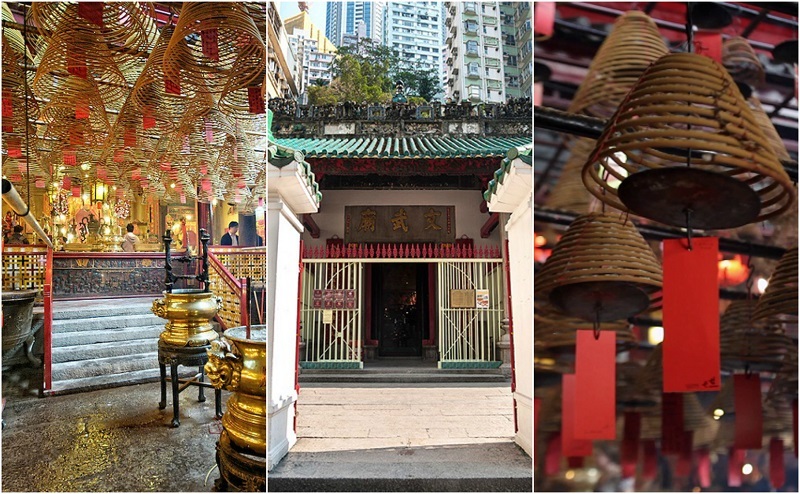 This vibrant, colourful temple is dedicated to Tin Hau, goddess of the sea and the antique building is a huge contrast to the highly cosmopolitan area around it. Take the subway once more up to Mongkok (or you can walk if you so wish – it’s just one stop away). Be prepared for an attack on all senses in this crowded Hong Kong shopping district. Neon lights flash different colours from every angle, the air is filled with the scent of street foods, the floor beneath you tremors at the base of the music from nearby stores, and more signs hang overhead than you ever thought possible. It’s not luxury shopping, but this place is worth a visit just for people watching alone. Spend a few hours in this area as there is just so much to see, and you can enjoy getting lost among the twisty streets and market stalls while watching on as Chinese vendors pitch their wares. There are maps everywhere in this area to help you navigate so rest assured, it’s easy to get around. Look out for Ladies Market (Tung Choi street) – a cluster of streets with stores and stalls selling everything from accessories to cosmetics, Sneaker street (yes, bizarrely it’s exactly as the title suggests), Fa Yuen street market (exotic foods and fresh veggies) and the goldfish market (yes, also exactly as it says on the tin). When the sun starts to go down, head over to Temple street and browse the night market there. This is a great opportunity to trial out some street foods, visit a Chinese fortune teller, and watch in fascination as Chinese opera singers perform in the street. For dinner, why not fill up on the street foods available here, or at one of the authentic street side restaurants? 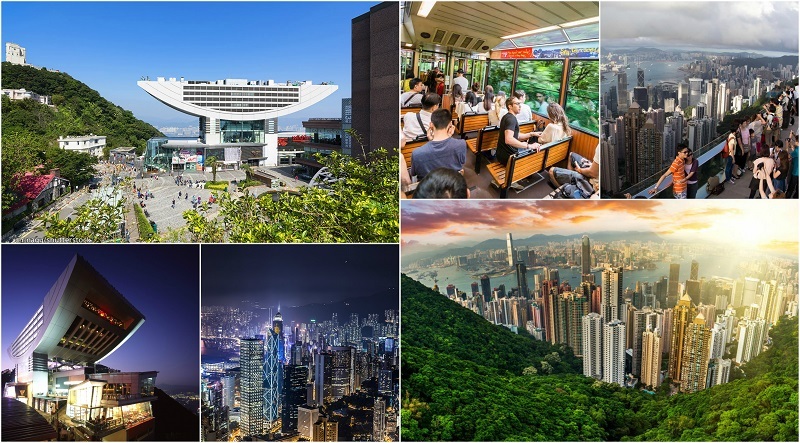 On the journey back home, stop off at Kowloon station and head to the sky100 observation deck. Located on the 100th floor of the international commerce centre, the deck beautiful views of Kowloon by night as the sun begins to set. If you opted for the Hong Kong attractions pass, then your entrance here is covered. If you’re feeling a little hungry, there is a cafe, and a restaurant serving a variety of international cuisines on floor 101. Home to Buddhist temples and small traditional villages, Lantau Island offers a great insight into both rural life and religion in Chinese culture. You want to dedicate an entire day to Lantau Island to give yourself the time to enjoy exploring. 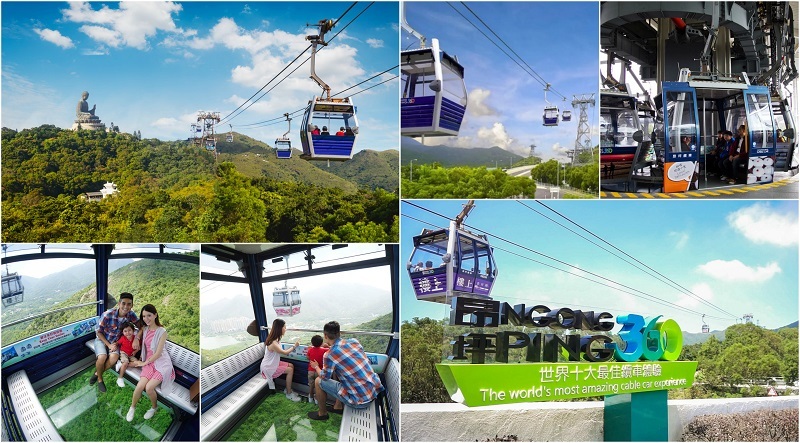 To get to Lantau island, you need to take the metro to Tung Chung station where you can take the Ngong Ping cable cars, or the bus if you prefer. (You may find that during adverse weather conditions, the cable cars are cancelled. This is particularly common if you are travelling during typhoon season which occurs between the months of September and November). Start by taking the bus to “Tian Tan” Big Buddha and prepare yourself for a workout fit for Hercules himself as you ascend the 268 stairs to meet Buddha at the top. Marvel at the architecture of the Buddhist sculptures, and let the views of Lantau Island below take your breath away. Walk around the surrounding area and enjoy the many Buddhist statues that are scattered around the grounds of this area. We recommend visiting the Po Lin Monastery restaurant for traditional vegetarian temple food for lunch. From Big Buddha, take the bus over to Tai O. This takes around 15 minutes from here. Tai O is a traditional fishing village where the quirky wooden houses are all elevated above the water on stilted platforms. The town has become more popular with tourists in recent years however if you are visiting in the off season, you may very well have the place to yourself. Tips: If the weather is bad, or you just prefer the bus then to get to the bus terminal, continue walking straight ahead on the road from Tung Chung station, past the cable car terminal and you will see the bus terminal on the left hand side. Buses run frequently around the island, timetables can be found at every point, and the information is in English. Head back to the hotel to freshen up after a busy day of exploration. When you are ready, venture into central district for dinner and drinks at some fabulous locations. There are many rooftop bars, and quirky cocktail places and part of the fun can be exploring the streets, and stumbling across new places. However some of our favourites include Honi Honi tiki cocktail lounge (cocktails in a Hawaiian setting), the elegant “Captains Bar” at The Mandarin Oriental, and Lily & Bloom, a bar which transports you back in time to the 1920s. For food, consider Mott 32, an upmarket meat restaurant adored locally for their Peking duck. Go easy on the breakfast portions today as we will have a food-filled day ahead. We are certain that you would like to rest your weary head after last night’s cocktails and all of the walking from yesterday so that’s why we’re going to take a more relaxed pace. Central district is home to many quirky coffee bars and boutique stores and you can have a pleasant time picking up some unique finds here or simply browsing. 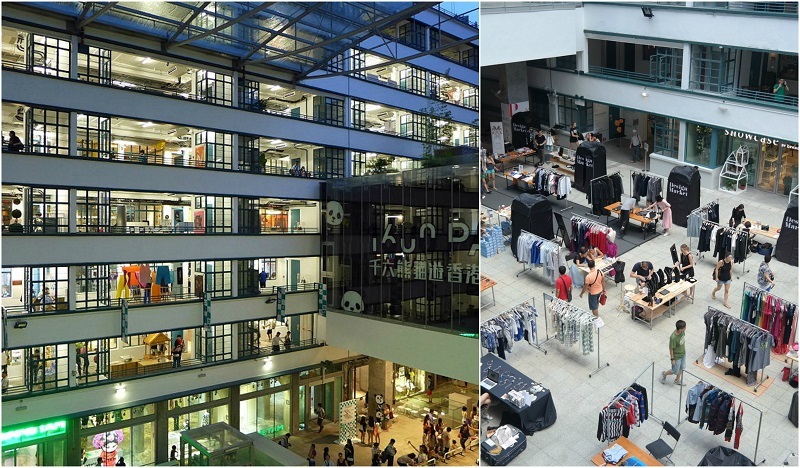 Be sure to check out the PMQ building which features pop up stores selling handicrafts, articles of clothing designed by local designers, and free art exhibitions. 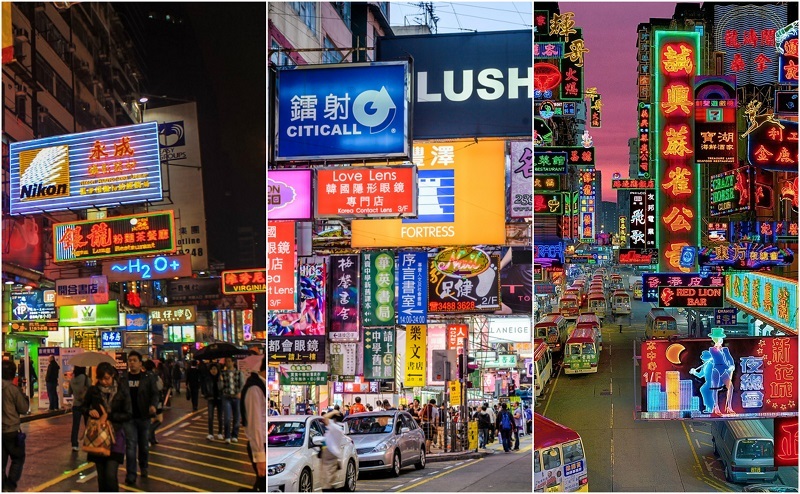 You may have noticed many influences of British culture scattered throughout Hong Kong – from the antique looking red telephone and mail boxes that can still be found on the streets, to the large number of British expats that call it home. 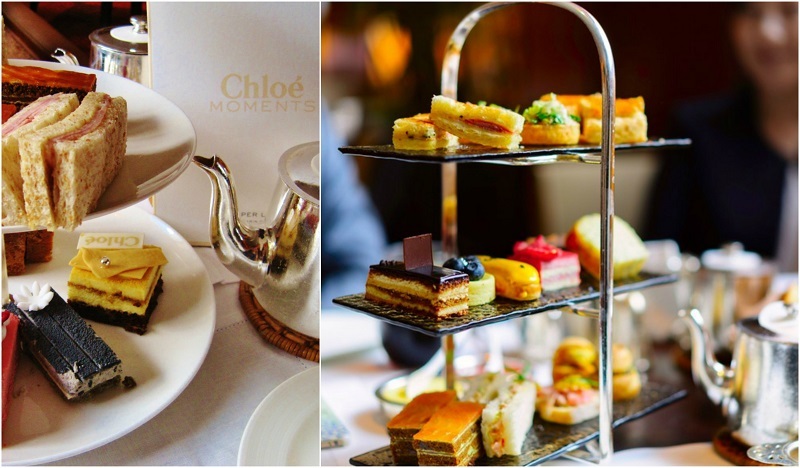 One of the most elegant aspects of British-ness that those in Hong Kong are particularly fond of, is the upper class tradition of going out for “afternoon tea”. There are many places on HK Island that offer this, but while you’re here, why not go all out and enjoy an afternoon tea that would satisfy even Queen Liz herself at the stylish Clipper Lounge. Enjoy your delicious array of teeny tiny sandwiches, cakes and pastries served with tea and champagne in a truly exquisite setting. 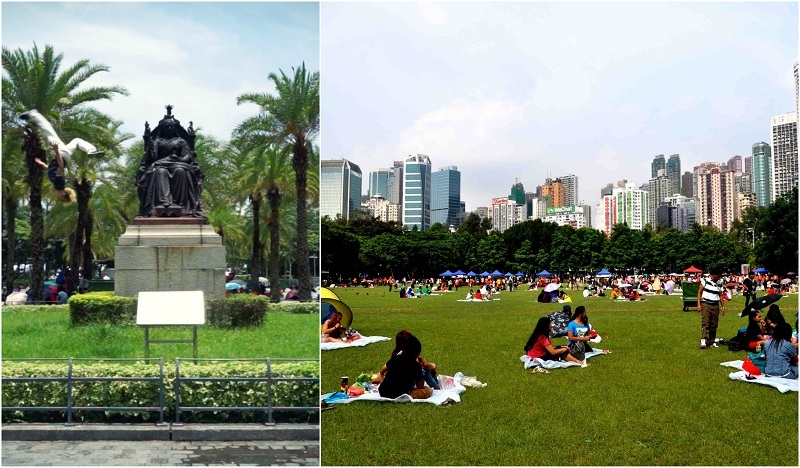 This is the largest park on Hong Kong Island and it makes for a beautiful, relaxed stroll. One of HK’s most popular tourist attractions, the Peak is the mountain point which offers the visitor stunning views of the city below. There is a reason that we scheduled this part of the itinerary for this time and that is because you will have the opportunity to see the city below not only during daylight, but as the sun goes down and the city becomes illuminated by lights. Sometimes, things aren’t quite what they seem – something which is definitely the case at the Hong Kong Trick Eye Museum. The “museum” is located at the same site as The Peak and sees you through a number of eccentric and quirky themed rooms. 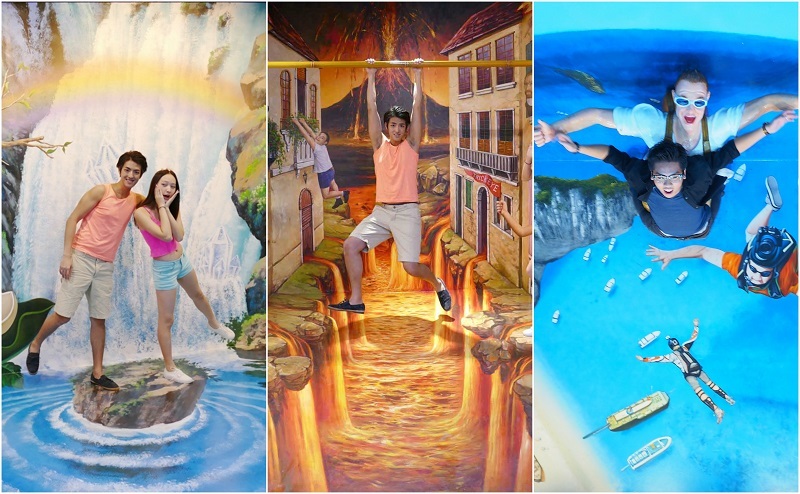 3D paintings jump out from the walls creating optical illusions that you can interact with and be a part of. Surprise and amuse your friends with travel photos that feature you as a circus trapeze artist (haven’t you always had the ambition to do that?) or riding a rooster (typical weekend activity, right?). An unusual attraction not to be missed, and which you can enter using the same Hong Kong Attractions Pass as the Peak – perfect! 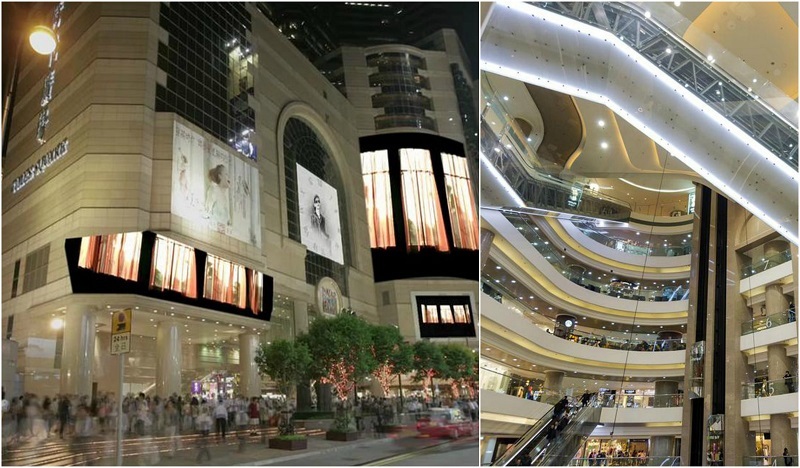 From high end stores like Gucci and Roberto Cavalli, to high street favourites and local brands, this is one of the most popular shopping areas in the city. If you do wish to shop, the stores are open until 11pm so you have plenty of time. When you are ready to eat, you can find many restaurants here selling global cuisines and local delicacies. 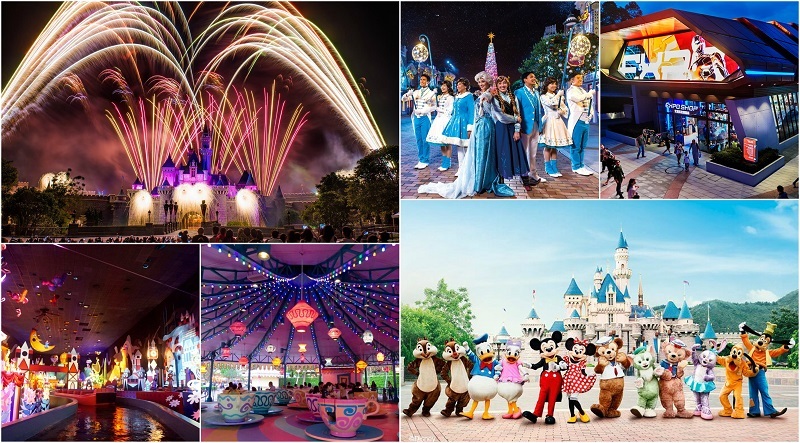 A visit to Disneyland is one of those guilty pleasures that you are never too old for, so unleash your inner child and enjoy a day at the Hong Kong park. The park is split into different “lands” which each follow a unique theme – from the futuristic Tomorrowland to the Wild West themes of Grizzly Gulch. There is certainly something for everyone, so whether you are an adrenaline junkie, or the type that just prefers to enjoy a pleasant boat ride, you will be all set. Be sure not to miss the “Disney In The Stars” firework show that happens by the Cinderella castle every day at 8:15pm. If you have opted for the Hong Kong attractions pass, then it has you covered for your Disneyland admission. If you decide not to, then the tickets can be purchased separately. Both one and two day passes are available for the park. One day admission weighs in at 589 HKD and two day admission is priced at 759 HKD. Discounts are available for children and seniors. From your hotel, you need to take the metro to MTR Hong Kong or MTR Kowloon station where you can then board the train bound for Disneyland. The journey from Hong Kong to the resort park takes around 30 minutes. You are required to show photo ID in order to enter the park. The opening hours of the park are from 10.30am to 8.15pm. There are several parades and shows that take place throughout the day so be sure to pick up an information guide upon entrance to the park so that you know the times and locations. If we haven’t worn you out yet, and you’re still enthused, and rearing to go, consider spending this day at Hong Kong’s Ocean Park. Disneyland may be the most internationally known, however Ocean Park is Hong Kong’s largest theme park…. Actually, to call it a theme park would be selling it short since Ocean Park is a zoo, a marine animal park, and an amusement park all combined into one. Here, you can see beautiful animals from around the world catch interactive shows at various times throughout the day, and adrenaline junkies can enjoy the rides. 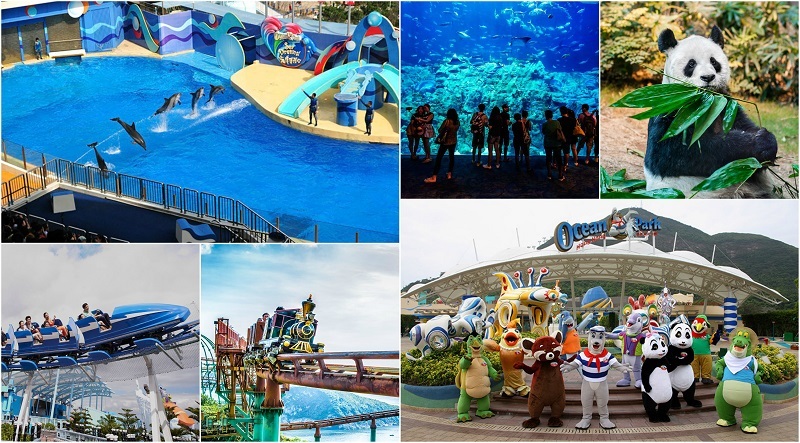 The opening hours of Ocean Park are from 10am to 7.30pm. There are a couple of ways that you can get to Ocean Park. For extensive information on this, check the park website here. The city bus 629 runs five times a day starting from 9.30am from central piers. If you are staying on HK Island or at one of our recommended hotels, that’s perfect as you can walk to the pier to take the bus. You can also take the MTR South line to Ocean Park station. If you opted for the Hong Kong attractions pass then this covers your park admission. Alternatively, entrance is $438 HKD per person for an adult and $218 per person for a child. 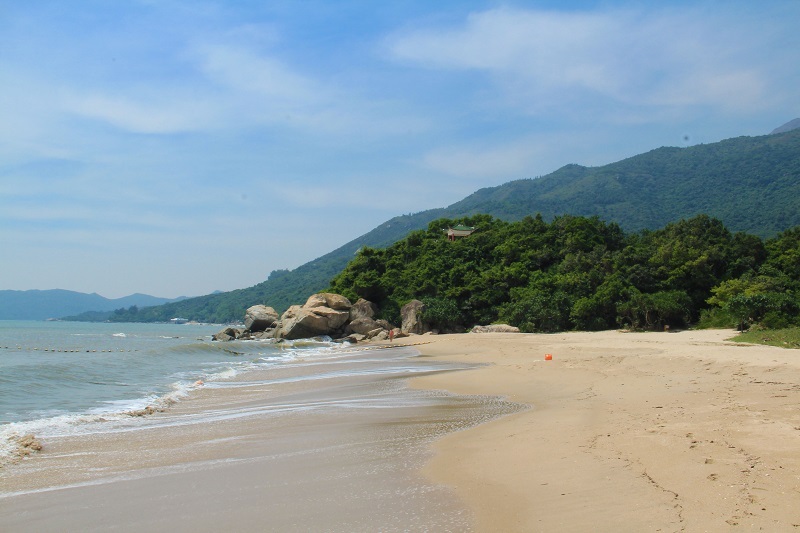 Hong Kong isn’t necessarily the sort of place that you associate with a beach break, but it does have stunning beaches which would rival California’s coastline… It’s just that the locals have done a good job of keeping them a secret! Repulse bay is nice, but it gets a little crowded and you won’t be able to relax when you are inches away from another holiday maker with no space and privacy are you? Instead, we will take a short ferry ride to Cheung Sha Beach. The beach is divided into two sections: upper and lower. The lower section (where you immediately arrive) is populated with many bars and restaurants, but a short ten minute walk leads you to upper Cheung Sha, a beautiful little cove that is free from the crowds. Is 5 Days in Hong Kong Enough? For most travellers I’ve spoken to, it’s probably yes. There are many attractions to see in this small city, but it all depends on what you’re interested in. People always talk about the great food and shopping in Hong Kong, but as you can see, there are a number of must see attractions and hidden gems worth visiting. 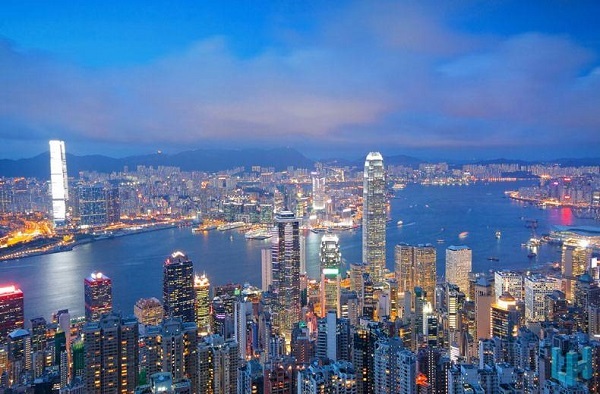 Are you planning a trip to Hong Kong soon? This itinerary is well though off and good for first timers and groups alike. Going around Hong Kong is not very hard since it has a good subway system. You can also ask around if ever you get lost. There is not a shortage of things to do in Hong Kong. Accommodation can be very expensive. Most of the time tourist stay in small hostels and guesthouses nearby TST. Great itinerary for solo travellers to be able to see both traditional and modern sides of Hong Kong. Disneyland is a must for adults and kids with all the memories it brings back. Lantau Island is perfect for relaxing among the temples and villages within. This itinerary is a great one especially for first-timers in Hong Kong. It has a nice balance of the traditional and modern sides of Hong Kong. It is easy to go around on your own (without joining tour groups) because a lot of people know how to communicate in English and signs in the streets and public transport are also available in English. Hats off! This is a must have itinerary which guides through all the major locations of Hong Kong while ensuring that one gets ample time to spend at each destination. It is definitely a handy itinerary for the ones who prefer travelling by themselves and dislike joining groups. I wish I had this itinerary instead of going with the generic and slightly overpriced tour the last time I’ve been to Hong Kong. This is a great itinerary for those who dislike joining tour groups and would rather tour at their own paces. I’d just like to point out though that there are also plenty of less expensive hotels and hostels you can check out that are satisfactory for your entire trip, especially if you’re a backpacker looking for just the basics. This itinerary covers many of the modern and the traditional parts of Hong Kong. But there are many old temples and beautiful country parks in the New Territories too. 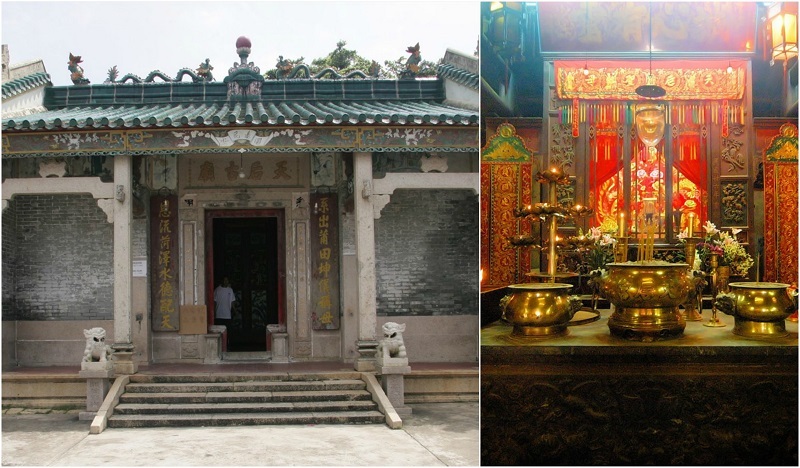 For example, Che Kung Temple is where you can wish for better luck and Feng Shui. 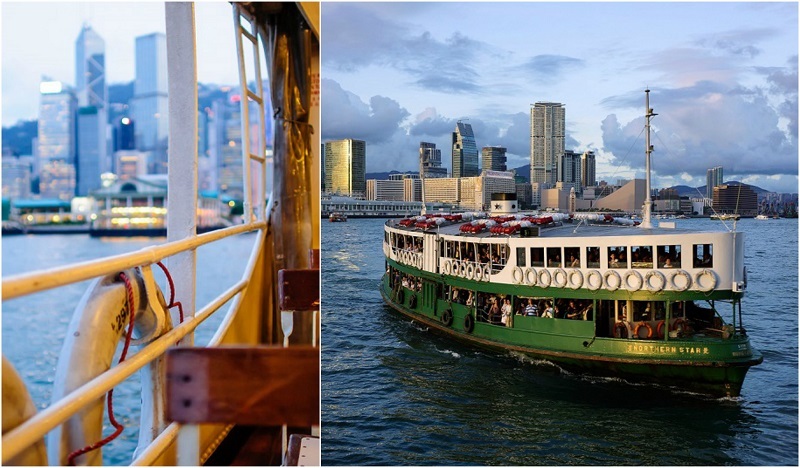 Also, taking Star Ferry is a great way to enjoy the famous and stunning night view of Hong Kong. You may consider visiting Avenue of the Stars and taking Star Ferry at night instead. Enjoy! This is a well thought out itinerary, I agree with others that perhaps there should be a day or half a day dedicated to being in the New Territories or other islands of Hong Kong for people to enjoy the seafood and beaches that Hong Kong has to offer. Overall, this is a great way to spend five days in Hong Kong, and I cannot recommend it more! Agreed. I reckoned should spend a bit more time in Tai O, it’s a lovely fish village and very different. and please please please, make sure you visit the beaches in Hong Kong in one of your days!! They are so beautiful! Recommend Sai Kung or beaches in Hong Kong Island! Enjoy your stay in Hong Kong!